Welcome to Estrella Vista STEM Academy! Part of the Littleton Elementary School District, and nestled in the scenic town of Avondale, Arizona, Estrella is a K–8 school that draws in students from across our community. Here a supportive staff, strong community, and involved families work together to provide a well-rounded educational experience for your child. We have created this website to help you gather information about your child’s education in an easy and clear manner. Please dive right in, and enjoy learning about all Estrella Vista STEM Academy has in store! Littleton Elementary School District actively monitors the content of this website. However, should you find an error or outdated material, please contact us. You can also email us to report suspected misuse of school resources, voice your concerns, or give us compliments. Welcome, Estrella Vista STEM Academy families! The 2018-2019 school year is proving to be another exciting year for teaching, learning, and community engagement. We are diligently working to improve school culture. Having the right environment to support student learning is essential. My goal is to ensure every child has the opportunity to learn in a fair and equitable educational setting. I look forward to collaborating with all stakeholders to foster this expectation. As a STEM Academy, we believe each child is a treasure with unique gifts, talents, and capabilities. We work collaboratively to discover and nurture those abilities through science, technology, engineering, and mathematics (STEM). We expect all students and staff members to be respectful, dedicated, hardworking, independent thinkers, and problem solvers. We are a trusted and established community committed to setting high standards in STEM with integrity and fidelity. We believe in developing responsible global citizens. We strive for every student, staff member, and community member to exhibit the utmost respect in all situations. We believe in building a cooperative and positive team environment conducive to the highest level of STEM learning. I look forward to working with our families to support all students on campus. 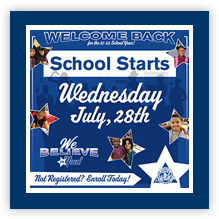 As a courtesy reminder, school opens at 8:27 a.m. and concludes at 3:35 p.m. After breakfast in the classroom, school begins promptly at 8:40 a.m. On early release Wednesdays, the start time remains the same, while our student release time is scheduled for 1:15 p.m. If you should ever have questions or comments, please feel free to email me. I would be more than happy to assist you. We would like to remind parents that school begins at 8:27 a.m. We consider students tardy starting at 8:40 a.m. We kindly ask all parents to help us by ensuring that all students are to school on time so they can participate in a full day of learning. Thank you for your support. We continue to make Estrella Vista an amazing place to be. Our only focus is to make learning fair and equitable for every child. What is fair, is not always equitable. Some students need more support than others, and our staff is willing to go above and beyond the call of duty. In the paragraphs that follow, I will share the engaging work we are doing with students, teachers, and parents as we move forward with our school-side focus. Finally, our parents engage in school-wide activities on a consistent basis. We ask our parents to participate actively in the classroom, support after school programming, and engage in parent-teacher conferences. It is imperative we work with our parent community to promote an environment conducive to learning. I recognize the significance of teamwork. It takes the contribution of every student, teacher, and parent to be successful at Estrella Vista STEM Academy. Making learning fair and equitable is the responsibility of the team. If you have any questions, please feel free to contact me any time. I would be more than happy to assist you.